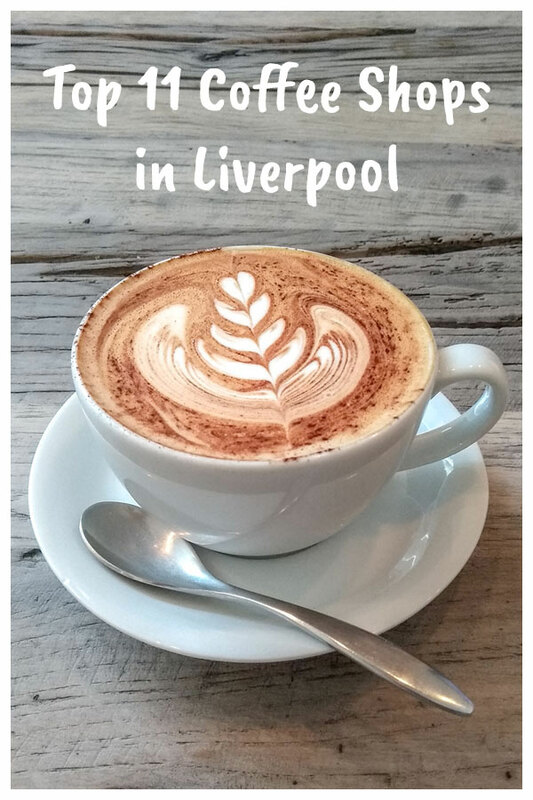 As a coffee lover, I have explored most of the cafes in Liverpool city centre, where I lived for the last 2 years. I have to say that Liverpool is a great place to enjoy a nice cup of coffee, with coffee places for all tastes. I mostly go to independent or small cafes, since I dislike ‘corporate coffee’. Here are my favourite coffee places, where I went again and again. Highly recommended. One common aspect of most cafes in Liverpool is that they close around 6pm or 7pm on weekdays. But some of them stay open until late and turn into a bar in the evening. 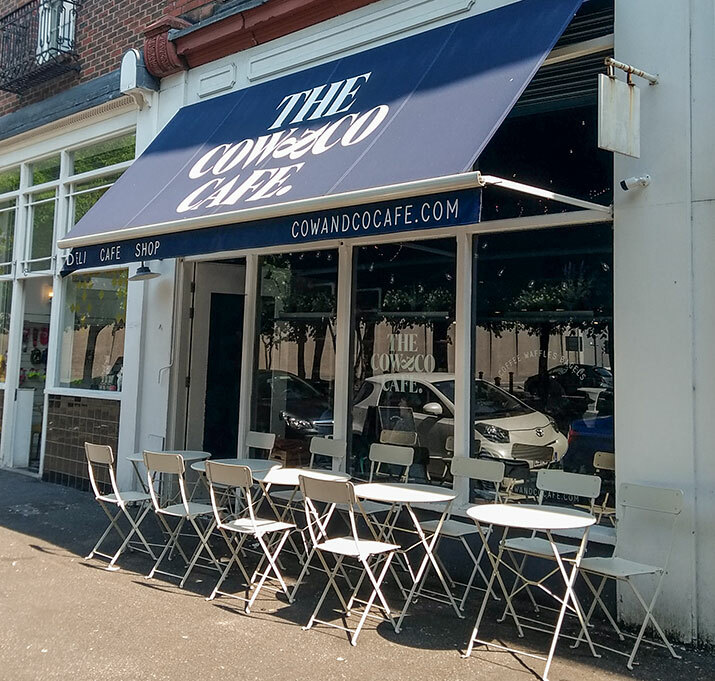 I’ve linked each cafe’s website in the title, so you can check the opening hours before going. Speciality coffee and coffee art. This is honestly the best coffee I’ve ever tasted (let’s say outside Italy 😉 ). These guys treat coffee as a science. On the walls you can see artwork that explains how the coffee is made, how long it is brewed for, how much water is used, where the coffee beans come from, what is the difference between different coffee varieties and a lot more. Apart from the classic espresso variables, like cappuccino, latte, etc., they also offer different brewing methods for filter coffee like Aeropress, Chemex and Hario V60. (Don’t know what these are? Me neither. Click the names to find out or let me know which one is worth trying.) And I love their logo! The only downside is that it is now more expensive than anywhere else I checked (£3 for a cappuccino). This one wins for the most cosy cafe in Liverpool, with big comfortable couches, high bar stools and classic coffee tables. 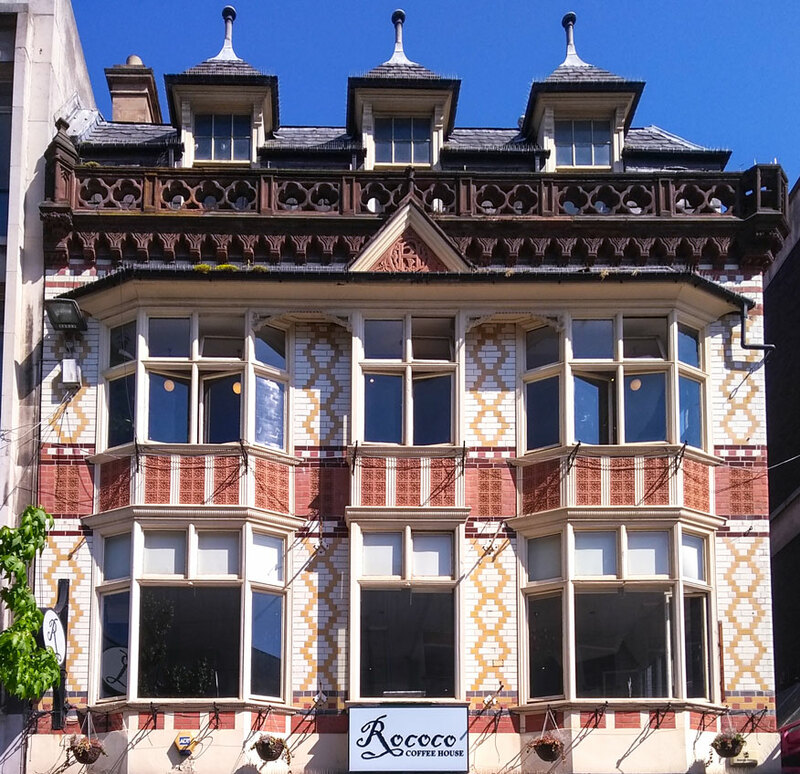 It is in a very nice, old Victorian building with four different rooms over two floors to enjoy your coffee. They have tried to decorate it in a modern rococo style with chandeliers, mirrors and intricate patterns in the upholstery. I am guessing this is also where the name comes from, but I think the style ends up being quite mixed. The facade of the building is really beautiful though. Right in the heart of Liverpool, in the Liverpool One area among all the big brands. Great for a coffee break after shopping. Nice cafe on the ground floor of the Everyman theatre building, adjacent to the theatre’s entrance. They offer coffee, drinks and food, as well as pre-theatre menu. The seating area is very nice and big with tables made of wood and metal, leather chairs and stylish lamps. The tables are perfect for working on laptop and it is not very busy during daytime. 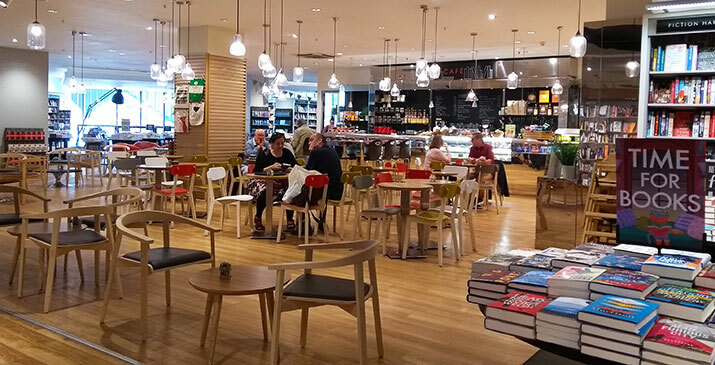 It is the coffeeshop on the first floor of the Waterstones bookshop. The coffee is very nice. It was recommended to me by an Italian friend, so it must be good. Nice wooden tables, chairs and sofas. Great place to work and get inspired by all the books around you. Feel cultured surrounded by books. Small coffee shop in Bold street, closer to the Bombed Out Church side of Bold street. 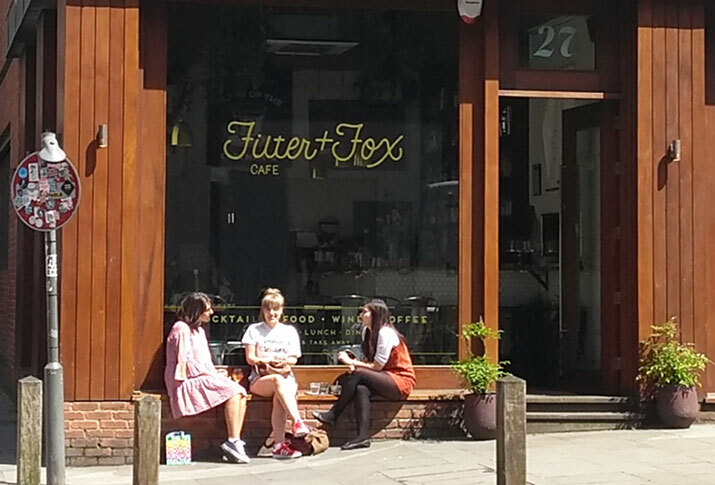 Everything you can expect from an independent hipster cafe, including small cute wooden tables and a bigger table in the back. This coffee shop does get busy and noisy and the tables are very close to each other. But they make very nice coffee and breakfast. It all depends on what style of cafe you prefer. They have the best creamy mushrooms, although food is a bit expensive compared to other places. Another hipster coffee place this time a bit further from the centre, in the corner of Hope street and Hardman Street, opposite the Liverpool Philharmonic Hall. The coffee is nice and the environment cosy, although a bit small. It is usually busy, even in the morning. Maybe because it is close to the University area. Great if you are in the Georgian Quarter or Hope street areas or want to get a bit out of the more crowded city centre. Another great coffee place in a spacious environment with big couches and tables. Although the colours are on the cold side, this place has a cosy feeling. They also offer food and happy hour in most evenings. 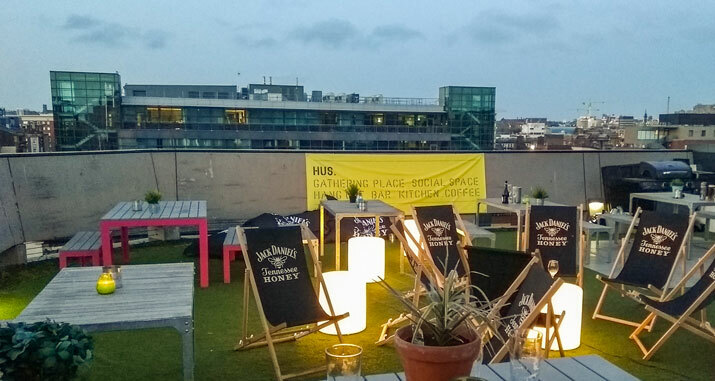 There is also a beautiful roof garden which opened recently complete with a bar and bee hives! You can enjoy a nice view of Liverpool’s seafront from there. This one stays open until late and is more like a bar in the evenings. …but toilet is in the basement. Not sure if there is a toilet on ground floor or lift. 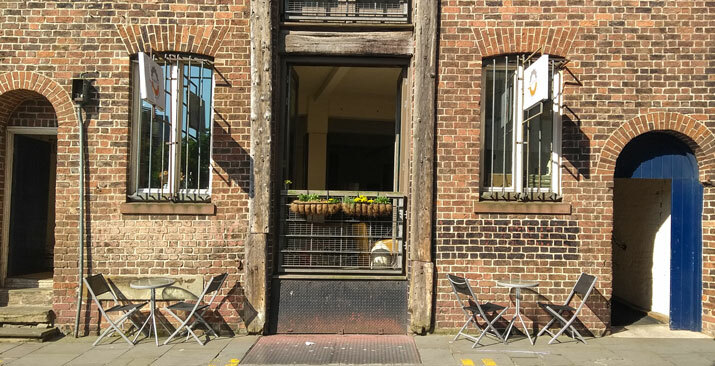 Pretty little cafe in a hidden, but very beautiful spot of Liverpool city centre. Only four tables on the ground floor, but extra floor upstairs. They make nice coffee and homemade cakes, as well as breakfast/brunch. Last time I went, they had gluten free and vegan options for cakes. It is great for a sunny day to sit on the tables outside, right in front of a small park. This one reminds me of picturesque cafes in continental Europe. This is a lovely, very small and cute coffee place that serves coffee, drinks and some food. It gets very busy after working hours and in the evening, when it is mostly a bar. Fun fact: when I first went they only served one kind of beer, a Greek beer called Fix! How cool is that? Now I saw that they have added more beers in their menu. I didn’t go to this one much, because it was just below my flat, but it is really nice! If I remember well, they serve coffee with a small snack, like a wafer, as you can see in this picture. This is the way coffee is served in Greece, with a cookie or bisquit. There might some connection which I have to find out… This place is very classy and romantic, so many people go there on dates! It’s very small, so you will be lucky if you find a table. This is one of my favourite places for morning coffee and breakfast. 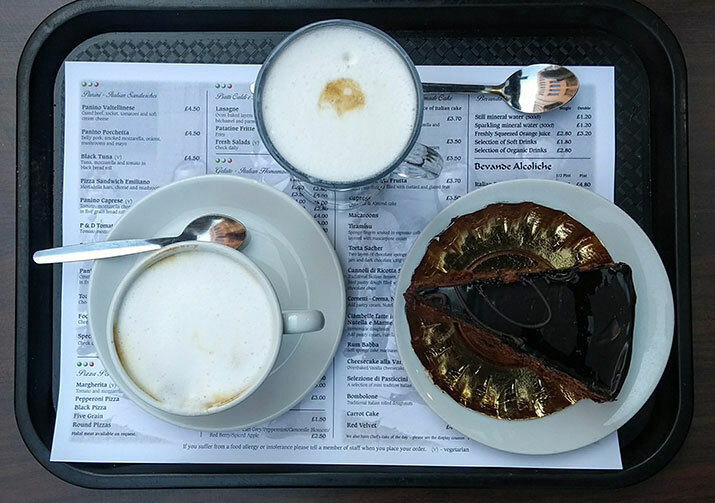 Apart from the traditional Italian coffee that is always good, they have a very large variety of italian cakes, snacks, pizzas and sandwiches in italian breads. Also, try their pistachio ice cream. One downside of this cafe is that the seating area is not that inviting to stay longer. It’s more of a traditional type of cafe, rather than a newish ‘hipster’ place. It makes sense, since the italian way is to drink your coffee quickly and go. This is another hipster cafe in a renovated old building that used to be some sort of factory. They have kept some elements of the old factory and have included them as part of the decoration theme. It has nice couches and armchairs and it is quite spacious, with a relaxed atmosphere. Apart from nice coffee and homemade cakes, they also serve breakfast and brunch. Every time I go there I see new sorts of cakes and I think they experiment a lot with vegan recipes. I had a Nutella cupcake once, which was yummy! 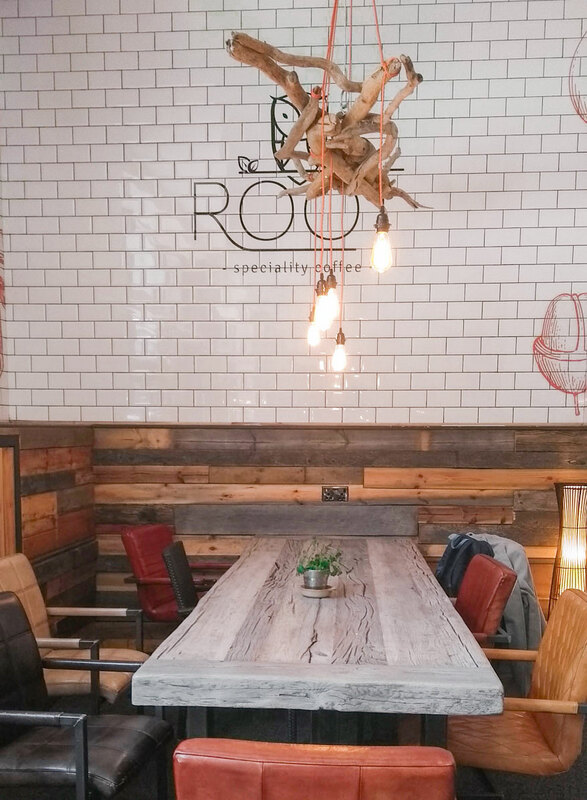 Service: Root, because they bring the coffee to your table. 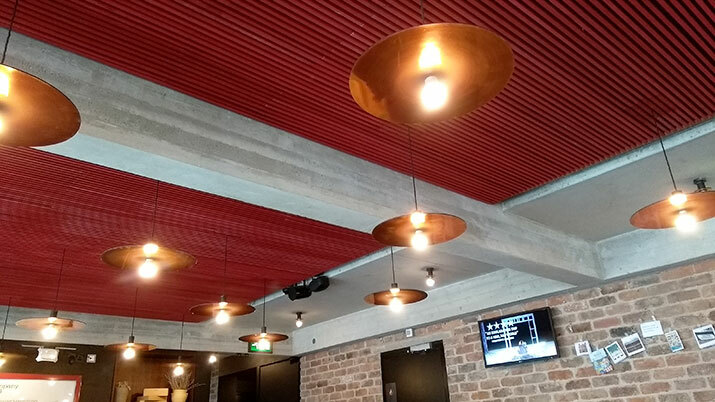 Location: Cow and Co, very close to Liverpool One, but in a more quiet and secluded area. These are some places which are mostly famous for brunch and they are very nice. Both in the Georgian quarter, although Moose has another branch in the Moorfields area. You can have nice coffee here as well. The Quarter has the most amazing cakes, while Moose is famous for its American style brunch, coming in big quantities (for me), but very tasty! Which is your favourite cafe in Liverpool? Any other suggestions? Tell me in the comments. >> If you found this interesting, why not share it with someone who might like it too?